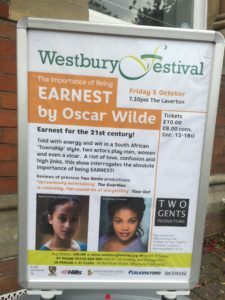 The Importance of Being Earnest, is a play written by Oscar Wilde. 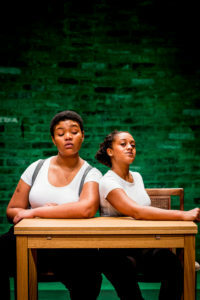 We are performing it as two women of colour, that is myself and actress Kudzanayi Chiwawa. Between us, we are doing ALL of the parts. This means multi-roles, multi-accents and taking the confusion of this play to a whole new level. Earnest is a farcical play. It involves mistaken identity and basically, gaslighting. I am fascinated by the concept of gaslighting because I think it happens so much and is still being discovered on major and minor levels in our loves. For those who have not come across the term yet “gaslighting” is the word for when you manipulate (someone) by psychological means into doubting their own sanity. The Importance of Being Earnest is a comedy. Within it, when you delve into the issues, there is a very dark side. For example, there are matters of abandonment, child abuse, child neglect, domestic abuse, lying, bullying, and manipulation. Furthermore, there are very real themes of being an outsider and questions on class, status and belonging. In our delivery of Earnest we are being led by two incredible artists, namely Arne Pohlmeier (director) and Tonderai Munyevu (co-director and actor). Together, Arne and Tonderai are the Two Gents. 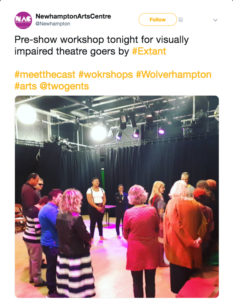 Two Gents is the name of their theatre production company, which they have been running successfully for the past ten years. 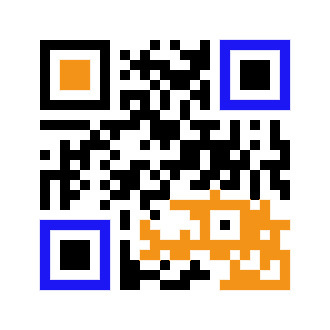 “We are a cross cultural touring theatre company based in London. We write, devise, develop, and perform challenging and unique work that draws equally on classic texts such as Shakespeare and our experience of migration and displacement”. Kudzanayi and I are each 50% of the cast for Earnest. We have been given space to develop Earnest with our own experiences as an underscore. This is something I will forever be overwhelmingly thankful for. I have been challenged to an extreme level as a performer. 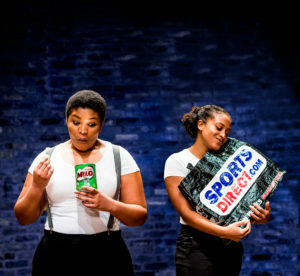 Consequently through being in tour we take the show to different venues and audiences and use audience interaction as part of the story-telling. This takes deep self courage, and great theatrical talent. Not to mention all the character development as we have over four characters each. Earnest was written by Oscar Wilde at a time when to be homosexual in England was illegal. As a homosexual man, he was in the middle of trials, which led to a prison sentence, illness, and eventually his death. Incredibly, Wilde gives a prophecy in the play through the lines of the character Jack Worthing: “my brother…my brother Earnest…he died…in Paris…of a severe chill”. After writing the play, Oscar Wilde himself died of a severe chill, in Paris. 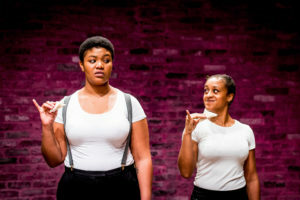 It feels aptly profound to be performing this play as two black women. Oscar Wilde was hiding, because of his sexuality, he was an outsider. Black women often hide in many different ways. This includes not showing our natural hair, to changing our tone or speech in order to avoid discrimination. The unique challenges to survival (let alone thriving) that black women face due to the intersectionality of our gender and race is not a new matter. However, it IS an on-going fight. This play is usually performed as a light comedy commenting on British manners and the upper classes. In presenting it ourselves, we challenge the play simply stepping onto the stage and saying “we own this”. It is the best feeling, and I feel it respects the true spirit of the fight and struggle. There is hiding and pain within the text of the play as experienced by the author himself. I hope Oscar Wilde would commend us for it. So far, our feedback from Earnest has been excellent. We have performed in churches, community centres and also theatres. 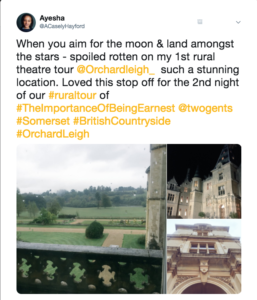 Thanks to Applause Rural Touring (who provide an ability for venues in Kent and Sussex to book theatre for their local communities including at discount rates) we have had full venues and engaged audiences. 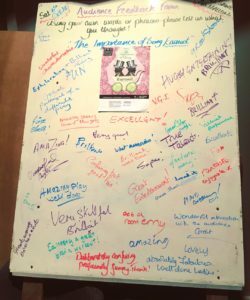 From some who have never heard the play, to others who know every line, we have been kept on our toes and also supported with standing ovations, laughter and curiosity. We are going to be able to share the work in London for a whole three weeks at Tara Arts Theatre in spring of 2019. 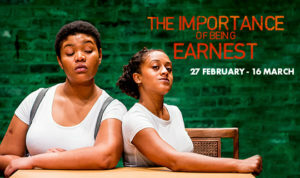 In the meantime, we will be continuing to delve to the heart and soul of Earnest, what it means to us, what it means to society today, and where we can go next with it. Tickets for the London show are on sale now! A beautiful opportunity to do a pre-show touch tour – actresses Ayesha Casely-Hayford, Kudzanayi Chiwawa and director Arne Pohlmeier.